Deb Covell [UK], Don Voisine [US], Tiberiy Szilvashi [UA], Kazimir Malevich [UA]*. 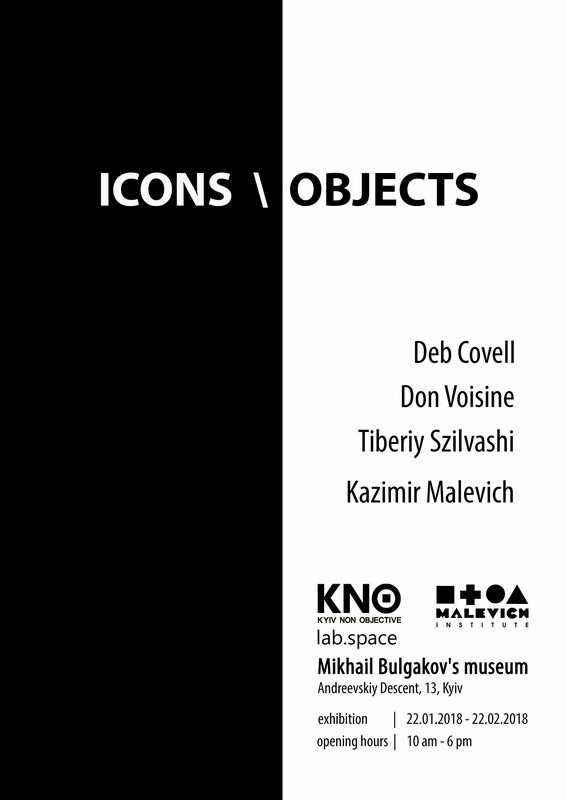 'icons \ objects' is the first exhibition of KNO.lab project series, which took place in the Mikhail Bulgakov museum in Kyiv. The project will be realize in 2018 as the series of experimental exhibitions, which will feature works of Ukrainian and International artists. The concept for the series of experimental exhibitions is a work with "forces" which form a visual space, with "elements" of the space, and studying of their boundary situations. Visual production takes place on the territory where "symbolic" meets with pre-language; aesthetic with social; "visible" meets with a viewer. What the conditions needed for the appearance of artwork? Where the boundaries of real and imaginary? Between emptiness and Object? Between an imprint and Image? Can the image exist in the works of non-objective art, if in such works the image can only appear in its pre-linguistic form? Non-objective art with its centennial history and its contemporary forms such as "reductive art" and "post-formalism" have become a visual language with a wide range of artistic forms, in which the image as a notion and its function is under the question, as and all other categories of visuality. KNO.lab program is a continuation of work that have begun five years ago by the artistic group Alliance 22. * - typewriting papers of Kasimir Malevich's article "Architecture, Easel painting, Sculpture" from the private archive of M. Kropivnitsky. We express our gratitude to the Kropivnitsky family for providing archival material. Opening January 22th, 6-8 pm, 2018. On view through February 20th, 2018. Open hours: 10am–6pm. Closed - Wednesdays. The typewriting papers of Kasimir Malevich's article "Architecture, Easel painting, Sculpture" from the private archive of M. Kropivnitsky.